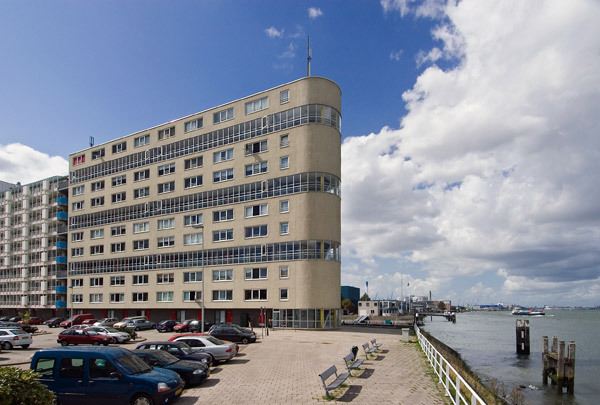 Like a train, this ten-storey housing block pulls its rolling stock, an existing 200 m. long apartment building, in the direction of the Nieuwe Maas river. This image of forward motion is strengthened by the building's semicircular end and by the horizontality of the east elevation with its three glazed access galleries in the otherwise relatively unenlivened surface. Because each gallery accesses three levels of housing, for each bay a dwelling unit of one and a half bays above and below the gallery, there was enough financial leeway to have the galleries glazed to keep the wind out.